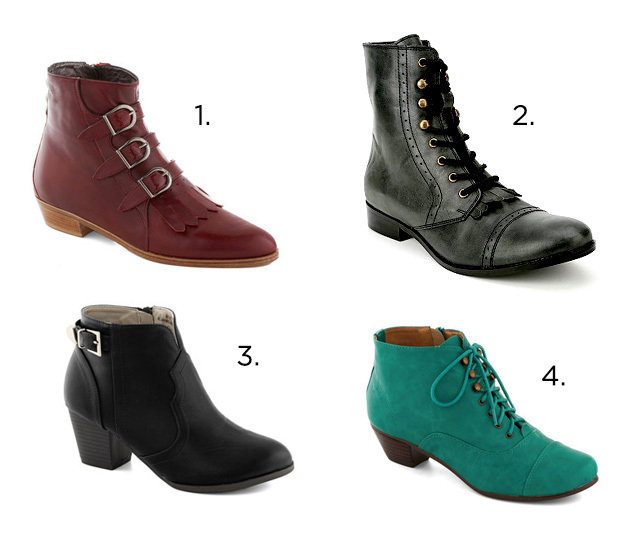 There are so many good boots out right now-- I find myself winding down at night on the computer, and I'm not complaining about all the pretty booties there are to look at. Plus, low boots are such a good transition piece. What's your favorite thing to window shop right now? ooooh! those teal ones, i need them! The real booties are adorable! I get so scared with color though. Will I ever have anything to wear this with? But of course I will. I've been window shopping jackets since early August. I just can't help it! The teal ones are SO pretty! I've been stalking whole outfits for some inspiration when the temps drop and I need to layer. Layering gets hard! Ohhh, I want them all! Can't wait for it to cool down so I can bust out my fall best. I love the Black Ropers, they would look pretty with a black tight and a colorful dress for autumn. My sister bought a pair, which looks like this one, a few days ago <3 I also really love Cowboy Boots for this autumn! Loving #3! I'm definitely ready for fall. These are great options!! These are lovely! I'm on a major hunt for a new coat. No luck yet, but I'm sure I'll find a good one soon! Love your choices, especially the teal! I looooove the first ones! The teal is gorgeous! I haven't ever bought a pair of booties for myself, but this fall just might be the perfect time. The teal booties *swoon*! Too cute! Right now, I am ogling maxi dresses, shorts and tights, cute boots and lots of scarves! I've been loving booties as well! There's a pair from ALDO called the Josseline that I've had my eye on forever. They're literally my dream boots! I have to agree! I'm obsessed with booties right now. I've also been crushing on some cranberry trousers for Autumn. Love your style! Yup. I definitely need ALL of these.